An Architectural Technologist by education, I have become a passionate designer of custom kitchens, bathrooms and other living spaces personalized to reflect the unique needs of an individual's lifestyle. With corporate headquarters based in Saskatoon Saskatchewan, Canada, Superior Cabinets has provided a creative platform for me to use this passion to assist and inspire others. It is becoming an industry leader in kitchen manufacturing in Western Canada and is widely recognized for its quality customer experience, kitchen innovation and employee investment. 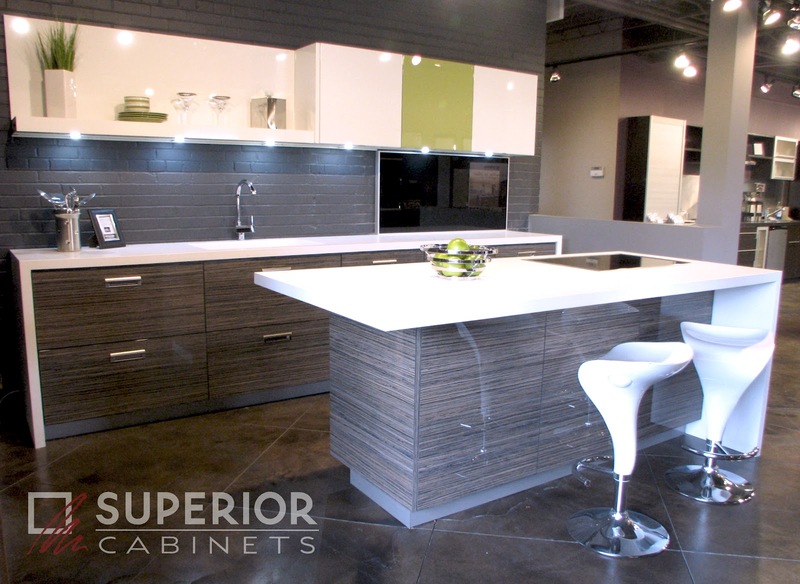 It is with great pride that I serve Superior Cabinets and its customers as a Design Consultant in Saskatoon. 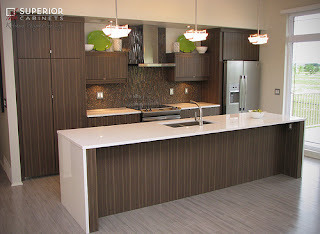 What you will find in this blog is a collection of photo's showcasing my designs, updates on the latest news, products and offers from Superior Cabinets, educational info regarding kitchen functionality and links to helpful design sites to gather ideas from. For more information regarding Superior Cabinets or to make an appointment with me, please email me at kevin.worman@superiorcabinets.ca. The luxury of having an island in the kitchen can bring added storage, prep space, an eating area and gives the home owner a chance to add interest to their home. Here are 3 important principles to consider when planning the most efficient island for your space. 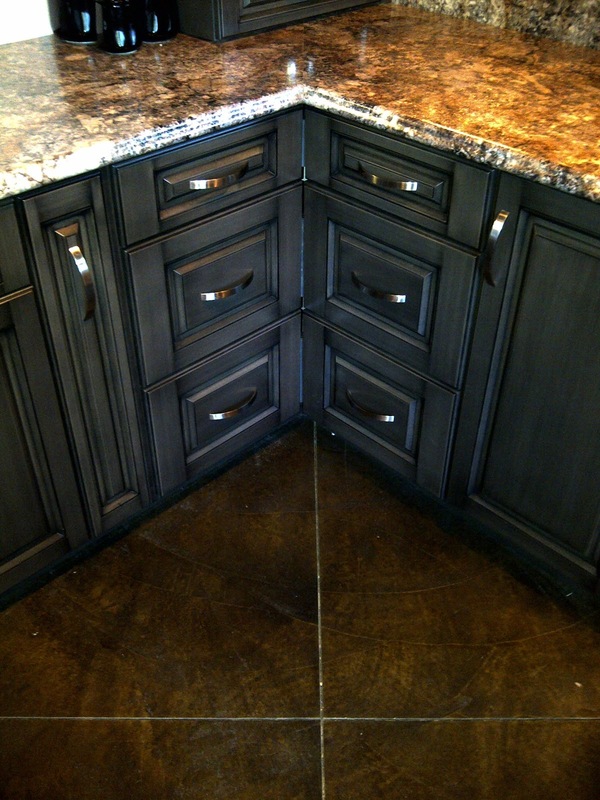 Often, the layout of the cabinets on your perimeter walls will help decide what your island’s main purpose should be. It is a given that the island will provide extra countertop space for food preparation but it should also provide a storage solution for another specific need as well. For example, it is commonly used for storage of non-consumable items such as pots/pans and large bowls. However, if you plan to have your sink in the island, it could be beneficial to integrate the dishwasher and a garbage/recycling area to create a centralized cleaning zone. 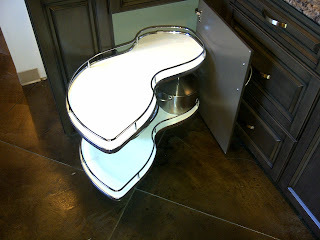 Planning the shape of your island is very important to maximizing its functionality. Its shape should complement and leverage the shape and size of your space. The island is often seen as a centerpiece in the home, especially in an open concept floor plan, and while adding angles to an island may add interest to your space, it may not get the functionality that it could from a rectangular shaped island. Angled islands will use more floor area than a rectangular shaped island and angled cabinets will limit the quantity and shape of the items you can store inside. If an angled island is desirable, first be sure that your storage needs have been met and that it will not interfere with traffic flow in the home. The kitchen is the heart of the home and a common place for entertaining. Most islands, these days, incorporate an eating area of some kind where guests can sit, have a drink, have a snack or maybe even a full meal. Many islands over recent years have been designed with a raised eating bar. 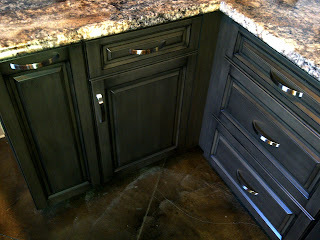 This is a 12-15” deep countertop raised about 6” above the main countertop at the back of the island. 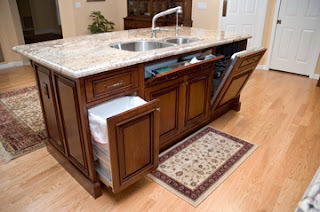 The advantages to this concept are that it can add interest to the island and it hides some of the mess on the main level that often results from food prep. However, going to a multi-tiered island will not give you as much functionality as an island with a single level countertop that has an extended overhang. Keeping the countertop at one level and extending the depth by the same 12-15” that the raised top has, will enable the cook to prepare food on a full 3’ deep island versus the 2’ depth that the raised bar top results in. It also allows those seated at the island a little more space to maneuver and no risk of anything falling off the back edge of the countertop surface. It is also a much more convenient space to use for serving buffet style food when entertaining a large group of guests. 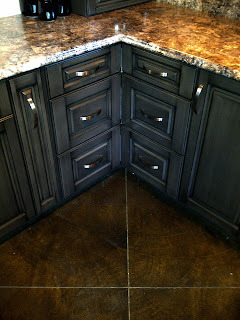 Part 3: Superior Cabinets "Urban Line"
1. Offer a high quality door and high gloss finish. 2. Stay authentic to the modern European lifestyle and look. 3. Make the product affordable. We found a door supplier that could produce an MDF door with a polyurethane gloss finish option. The doors are offered painted, wrapped in a GreenLam (laminate) or an engineered skin. We have offered all 3 as options in this product set, each available in either high gloss or matte finishes. -We added 3 different vertical lift door options. 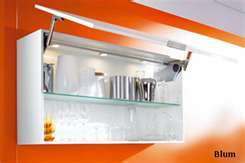 -Soft Close Drawers/Doors are standard. -Warm and cool LED lighting options added. There is a large gap in the market for this type of product. There is the low end which often features a Thermofoil (plastic) wrapped door and then there is the high end which is typically brought in from overseas. The Urban Line product set will price out very comparable to much of our current, more traditional wood product lines. Superior Cabinets has filled the gap for those that appreciate this design genre but aren't prepared to spend on the enormous price tag demanded by European manufacturers and are unwilling to accept a low quality replica. Part 2: What Defines “Modern European”? 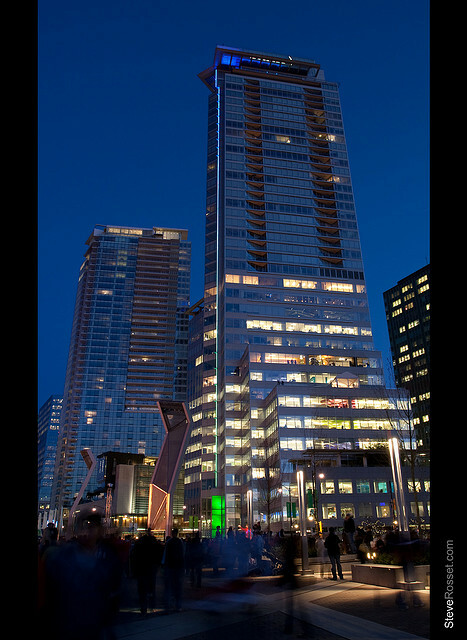 In Canada, we refer to this design style as “Ultra Modern”. Ironically, in Europe, it is the norm and has been for some time. The kitchen work triangle is now a concept of the past. 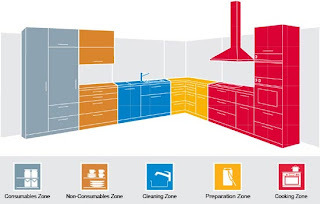 The kitchen is now being split into 5 zones that focus on particular activities. Created by European hardware manufacturer, BLUM, the “Dynamic Space” concept includes a Preparation Zone, Cleaning Zone, Cooking Zone, Non-consumable Zone and a Consumable Zone. The kitchen is designed in a way that encourages the cook to work in stations and keep the kitchen organized in a more practical way. This kitchen style is made for the consumer that appreciates simplicity. Perhaps the most important idea in achieving a modern European look is eliminating as many lines in the kitchen as possible. Get rid of the clutter and the tacky decorations. Gone are the decorative mouldings, corbels and intricate door profiles. Use 2 or 3 drawer cabinets throughout the bases for improved ergonomics and all fronts/doors should be flat slab with no profile. 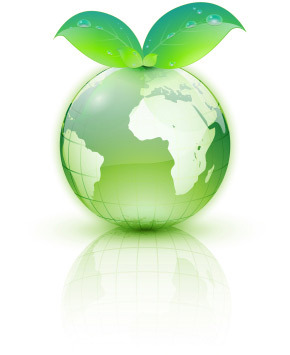 Materials used should be recycled product and recyclable products. 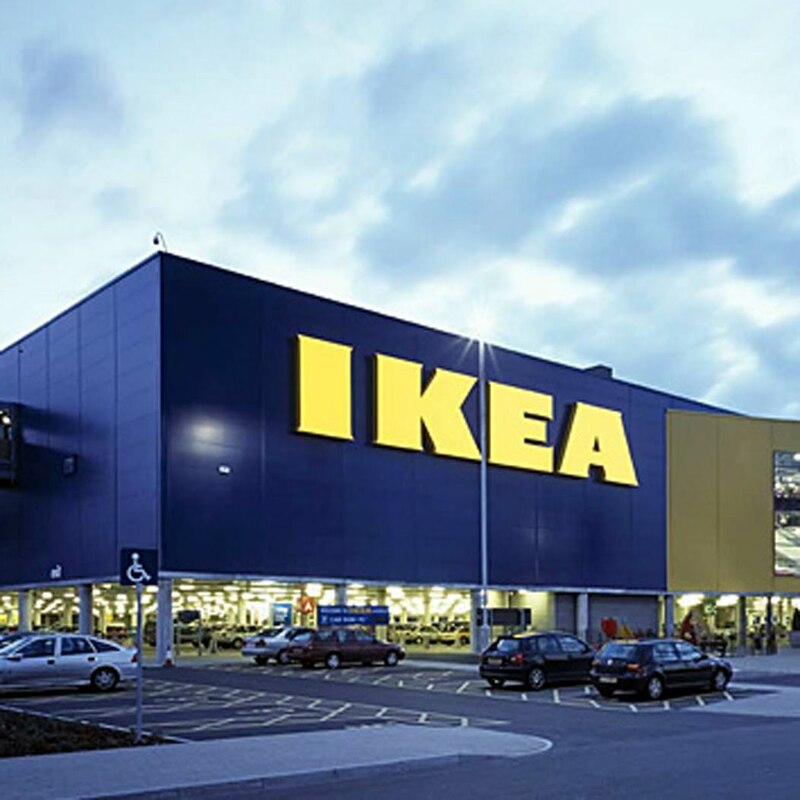 Exotic engineered veneers created from common wood fibres, recycled MDF and GreenLam products are ideal for door materials while low formaldehyde melamine products should be used for cabinet cases. A manufacturer that recycles its products and waste, creates a safe setting for its employees and is actively involved with its community is also an admirable feature to find in a supplier. High gloss polyurethane finishes, LED lighting, chrome and stainless steel accents and appliances are key in achieving the modern look. Lift up doors, corner drawer systems and soft close doors/drawers will give you the latest in kitchen technology. Part 1: Fad or Future? 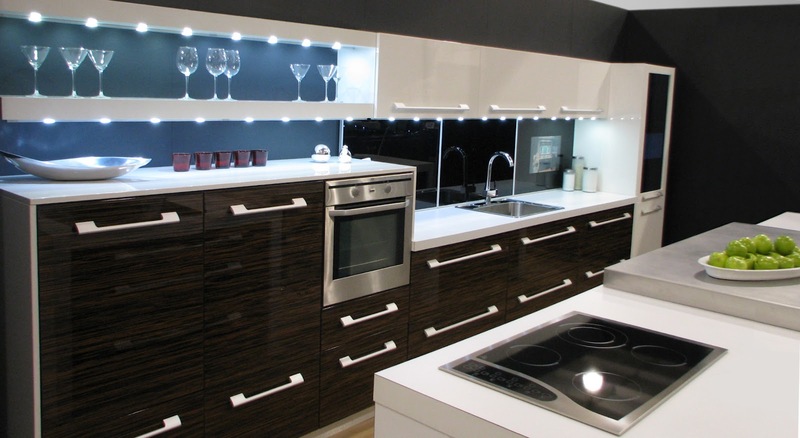 European kitchen design is slowly gaining a presence in the North American market. While it fights resistance from our traditional Canadian culture, many of today’s home buyers are desperate to break away from the norm. They want something different…. something “cool”. But is this design trend going to last? Is it a fad or is it the future? 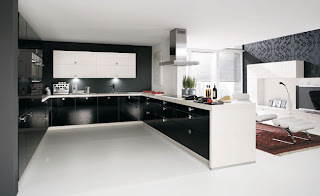 · A large number of the population in Europe resides in condo or apartment style buildings creating a need for a highly functional kitchen in a smaller space. · They go grocery shopping every day and as a result, their storage needs are much less. · Their appliances are typically smaller as well. Refrigerators & Ovens are most commonly 24” or 30” wide. · They have respect for the environment and have very little space for landfills. Appliances are built to last a lifetime and kitchen cabinet products are built like a piece of furniture so that when the home owner moves, the kitchen cabinets can potentially go with them. While their lifestyle may be quite different from the North American way, there is no questioning that Europe is the leader in technology, fashion and design. They are the best in the world at simply making things look good. Europe consistently sets the trends and what is popular there eventually becomes popular around the world. In spite of the cultural differences, we all share the desire to have pretty things. The look that Europe has established is very attractive to many of us westerners. 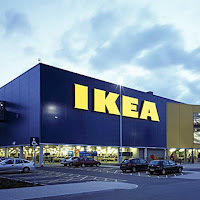 If there is any questioning that, one only has to acknowledge the success of a certain well-known European furniture company that has been making huge profits selling in North America for years (we all know the one). Why is it so successful? It is affordable, it is different and it has been viewed as a niche market that no one else has targeted. With a growing population, many large centers are opening their minds to the European strategy. Cities like Vancouver do not have any more land to build upon. 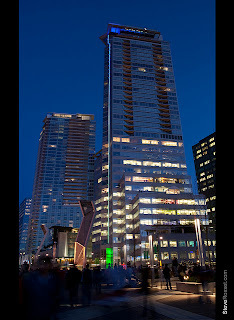 They are now building up with mega-structure condo buildings. Even in Saskatoon, a debate has begun on whether to build out or built up in an effort to keep infrastructure costs down. With people’s lives becoming increasingly busier, more and more people are moving into condos in an effort to minimize the daily chores that come with owning a house. It also enables a person flexibility to travel without having to find a way to keep a house maintained in their absence. In my time in the kitchen industry, many people have expressed admiration for this design style but fear that it may not be a timeless look. There may be a day when a new trend is created but don’t expect this European look to go away anytime soon, especially with the new generation of home buyers. The modern European kitchen can meet the needs of the person that wants the freshest look in a new house or the most functional application for a minimalistic lifestyle. In my personal opinion, this look is just beginning to be accepted in Canada and has a long life ahead of it. 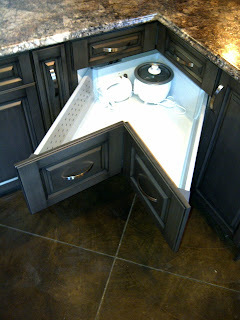 Maximizing the space in a kitchen corner has always had its challenges. Corner cabinets often result in deep, large spaces that require you to nearly crawl inside of the cabinet to access some of those commonly used items. Even the typical lazy susan can make things difficult as items often fall off the turning shelf and get stuck in behind, leaving you, once again, on your hands and knees manoevering around that awkward spinning shelf to retrieve your items. Committed to staying on top of the latest technologies, we have integrated two new corner concepts into our product line to provide alternative solutions for these cumbersome spaces. of all items and keeping them within reach. Unlike the typical lazy susan, this "Twin Corner Lazy Susan" rotates completely to come out of the cabinet once again giving you full access to your cooking tools and eliminating the need to reach inside the cabinet. 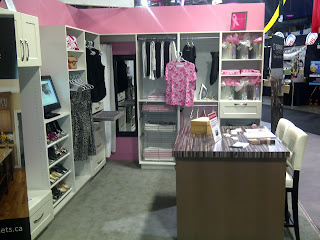 From October 14th-16th, Superior Cabinets showcased its new Closet Line at the "It's a Woman's World" tradeshow at Credit Union Centre in Saskatoon. While Superior's goal is to be a world class kitchen manufacturer, we also want to be a complete home solutions provider... a one stop shop, enabling the customer to work with one supplier throughout their project. 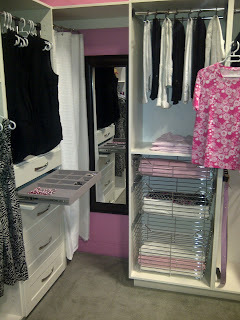 The launching of a Closet Line is just another step towards our goal. Here are some photo's from our display. and loves posing in front of pink backdrops. Our Closet Line products officially launch this month. 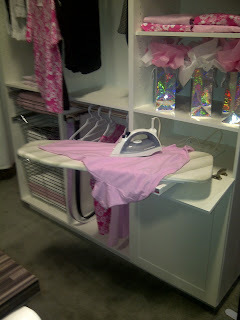 Here are a few photo's of our showroom display just installed. 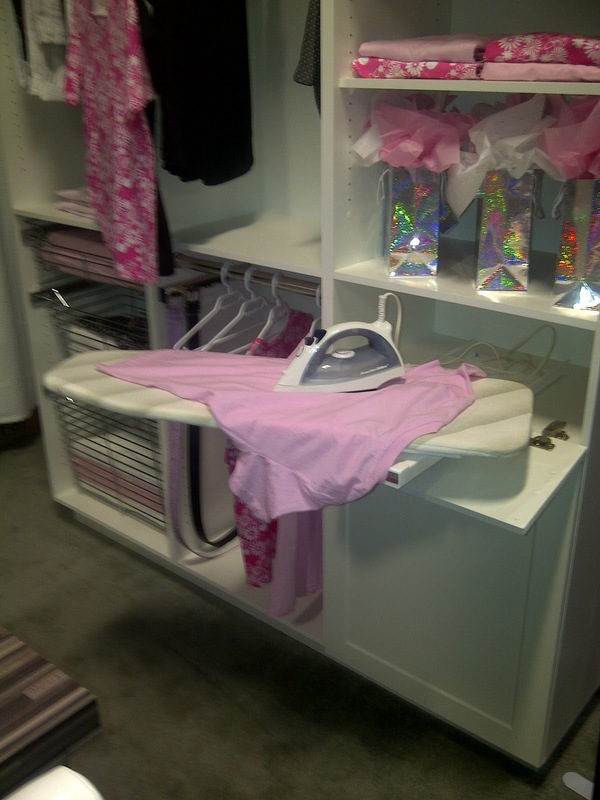 Many new gizmo's available to help organize your space inculding wire baskets, laundry hampers, belt/scarf/tie racks, jewelry drawers and even a roll out ironing board!